This material is taken from articles in our blog - The Vetiver Solutions Blog. Please visit the blog for additional information on The Vetiver System and its application around the world. What is The Vetiver System? Vetiver grass does not have stolons or rhizomes. Its massive, finely structured root system can grow very fast - in some applications, rooting depth can reach 10-12 ft (3-4 m) in the first year. This deep root system makes the Vetiver plant extremely drought tolerant and difficult to dislodge by strong current. It also has stiff and erect stems, which can stand up to relatively deep water flow. New shoots will develop from the underground crown, making Vetiver resistant to fire, frosts, traffic and heavy grazing pressure. Vetiver Grass is not affected to any significant extent by pests and diseases, nor does it act as a host for pests or diseases that might attack crop or garden plants. As seen in the picture from Thailand at left, the basic technique of soil stabilization using Vetiver consists of one or more hedgerows planted on the contour. Nursery plants or slips (clumps) of about 3 tillers each, are typically planted 6 inches (15 cm) apart on the contour to create, when mature, a barrier of stiff grass that acts as a buffer and spreader of down slope water flow, and a filter to sediment. Multiple hedgerows may be required to stabilize a slope. The development of strong plants and a deep root system requires full sun. Partial shading stunts its growth, and significant shading can eliminate it in the long term by reducing its ability to compete with more shade-tolerant species. When multiple hedgerows are required, each row must be planted with the same separation of 6 inches (15 cm) between plants. 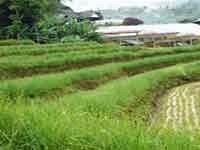 The separation between rows will depend on the slope, soil condition and composition, and the severity of the problem. As a rule of thumb, typical distances in domestic environment should range between three and six feet. 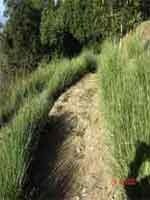 Some published guidelines recommend a distance between rows of about 5.7 ft. (1.7 m) for a 30° slope, and about 3 ft. (1 m) for a 45° slope. A good hedge will reduce rainfall run off by as much as 70% and sediment by as much as 90%. A hedgerow will stay where it is planted and the sediment that is spread out behind the hedgerow gradually accumulates to form a long lasting terrace with Vetiver protection. It is a very low cost, labor intensive technology with very high benefit/cost ratio. When used for civil works protection, its cost is about 1/20 of traditional engineered systems and designs. Engineers compare the Vetiver root to a "Living Soil Nail" with an average tensile strength of 1/6 of mild steel. Vetiver hedges are fully effective only when plants form closed hedgerows. Gaps between clumps should be timely re-planted. A very important characteristic of the "domesticated" Vetiver varieties from southern India used in The Vetiver System is that it does not produce seed and stays where it was planted. In some countries Vetiver has even been used to define property lines and hedgerows will not invade other areas of the property. Vetiver hedges are a natural, soft bioengineering technique - an eco-friendly alternative to rigid or hard structures. Being vegetative, it is also visually acceptable in any neighborhood. How do I use The Vetiver System? When used in the role of soil conservation and slope stabilization, Vetiver provides a simple and economical method to bind the soil with a deep and massive finely-structured root system. Vetiver roots are, per unit area, stronger and deeper than tree roots. 1. Plants must always be set in continuous hedges following surface contours. The hedge should provide an even barrier to the surface water flow, and create a filter that will retain the soil and allow the water to pass at a reduced speed. An improperly leveled hedge could direct the water flow to its lowest elevation, resulting in increased soil losses in that location. 2. New plants should be set at a separation of 4 to 6 inches (10 to 15 cm) within the hedge. The most effective way to start a new hedge is by using small, well-rooted plants that have been grown in a healthy, pest-free environment. A good root system in the new plant will ensure nearly 100% survivability and kick-start the project by 2 to 3 months. Alternatively, a slip (clump) of 3 bare-root tillers (growing root sections) can be planted directly on the soil every 4 to 6 inches (10 to 15 cm). Bare-root slips have a very high mortality when planted in poor soils, and this method is only viable when a large supply of mature plants is available for division. Allow for an additional three months of project completion when using this method. 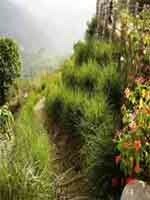 Vetiver hedges are fully effective only when plants form closed hedgerows. Gaps within clumps must be quickly repla nted with new or relocated plants. a 30° slope requires six plants per square meter (i.e. 7-10 plants per linear meter) and a distance between rows of about 5.7 feet (1.7 meter). a 45° slope requires 10 plants per square meter (i.e. 7-10 plants per linear meter) and a distance between rows of about 3 feet (1 meter). Warning: The Vetiver System is a new technology. As a new technology, its principles must be studied and applied appropriately for best results. Failure to follow basic tenets will result in disappointment, or worse, adverse results. Note: The two lower photos are from stabilization work done at the Blackberry Eco-lodge in India.